Economize R$ 44,74 (45 %). Comprar eBook Kindle. In this eye-opening account, Cal Newport debunks the long-held belief that "follow your passion" is good advice. Not only is the cliché flawed-preexisting passions are rare and have little to do with how most people end up loving their work-but it can also be dangerous, leading to anxiety and chronic job hopping. In other words, what you do for a living is much less important than how you do it. With a title taken from the comedian Steve Martin, who once said his advice for aspiring entertainers was to "be so good they can't ignore you," Cal Newport's clearly written manifesto is mandatory reading for anyone fretting about what to do with their life, or frustrated by their current job situation and eager to find a fresh new way to take control of their livelihood. He provides an evidence-based blueprint for creating work you love. 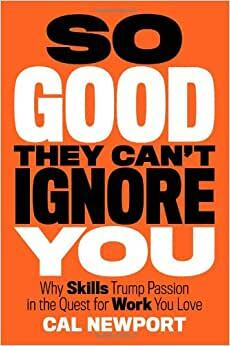 SO GOOD THEY CAN'T IGNORE YOU will change the way we think about our careers, happiness, and the crafting of a remarkable life. Comece a ler So Good They Can't Ignore You (English Edition) no seu Kindle em menos de um minuto. Cal Newport, Ph.D., lives in Washington, DC, where he is a writer and an assistant professor of computer science at Georgetown University. He also runs the popular website Study Hacks: Decoding Patterns of Success. 4,0 de 5 estrelasInteresting, but evasive in some aspects. "Working right trumps finding the right work""
That phrase defines the book. Basically, what the author states here is some sort of guide to find and achieve career success. I found the guide to be interesting but flawed. Flawed because it skips the most difficult part. The premisse here is that you have to build "career capital" first, and then start chasing things you actually care for, like a mission or more autonomy at work. The "career capital"is your differential, your unique value that is going to help you get there. What Newport fails to tackle is...how are you going to find the motivation to build career capital in the first place? And if you do, how can you be effective in your learning? He does talk about deliberate practice, about stretching yourself and about the importance of feedback (there is a very interesting book about that called peak experiences and another one called mastery). However what I would like to see would be something specifically applied to his model. Something not about learning itself, but about career trajectory, after all this is a book about career trajectory. 5,0 de 5 estrelasUp to the title! The things that make a great job great, I discovered, are rare and valuable. If you want them in your working life, you need something rare and valuable to offer in return. In other words, you need to be good at something before you can expect a good job. The Passion Hypothesis The key to occupational happiness is to first figure out what you’re passionate about and then find a job that matches this passion. Telling someone to “follow their passion” is not just an act of innocent optimism, but potentially the foundation for a career riddled with confusion and angst. Two different approaches to thinking about work: the craftsman mindset, a focus on what value you’re producing in your job, and the passion mindset, a focus on what value your job offers you. Most people adopt the passion mindset, but in this chapter I argue that the craftsman mindset is the foundation for creating work you love. This hour-tracking strategy helped turn my attention back above all else to the quality of what I produce. No one owes you a great career, it argues; you need to earn it—and the process won’t be easy. This is why I reject the “argument from pre-existing passion,” because it gets things backward. In reality, as I’ll demonstrate, you adopt the craftsman mindset first and then the passion follows. The Power of Career Capital In which I justify the importance of the craftsman mindset by arguing that the traits that make a great job great are rare and valuable, and therefore, if you want a great job, you need to build up rare and valuable skills—which I call career capital—to offer in return. television writing is attractive because it has the three traits that make people love their work: impact, creativity, and control. What interests me about Mike is that, like Alex Berger, he didn’t arrive at his outstanding job by following a clear passion. Instead he carefully and persistently gathered career capital, confident that valuable skills would translate into valuable opportunities. Unlike Alex, however, Mike started gathering capital before he knew what he wanted to do with it. In fact, he had never given a moment’s thought to cleantech venture capital until a couple weeks before his first interview. When you correctly understand the market where blogging exists, you stop calculating your bounce rate and start focusing instead on saying something people really care about—which is where your energy should be if you want to succeed. Mike Jackson, by contrast, correctly identified that he was in an auction market. He wasn’t sure exactly what he wanted to do, but he knew it would involve the environment, so he set out to gain any capital relevant to this broad topic. Once you’ve identified your market, you must then identify the specific type of capital to pursue. If you’re in a winner-take-all market, this is trivial: By definition, there’s only one type of capital that matters. For an auction market, however, you have flexibility. A useful heuristic in this situation is to seek open gates—opportunities to build capital that are already open to you. Step 3: Define “Good” It’s at this point, once you’ve identified exactly what skill to build, that you can, for guidance, begin to draw from the research on deliberate practice. The first thing this literature tells us is that you need clear goals. If you don’t know where you’re trying to get to, then it’s hard to take effective action. The appeal of control, however, is not limited to farmers. Decades of scientific research have identified this trait as one of the most important you can pursue in the quest for a happier, more successful, and more meaningful life. Dan Pink’s 2009 bestselling book Drive, for example, reviews the dizzying array of different ways that control has been found to improve people’s lives.1 As Pink summarizes the literature, more control leads to better grades, better sports performance, better productivity, and more happiness. If you want to observe the power of control up close in the workplace, look toward companies embracing a radical new philosophy called Results-Only Work Environment (or, ROWE, for short). In a ROWE company, all that matters is your results. When you show up to work and when you leave, when you take vacations, and how often you check e-mail are all irrelevant. They leave it to the employee to figure out whatever works best for getting the important things done. “No results, no job: It’s that simple,” as ROWE supporters like to say. The First Control Trap: Control that’s acquired without career capital is not sustainable. the second control trap, which warns that once you have enough career capital to acquire more control in your working life, you have become valuable enough to your employer that they will fight your efforts to gain more autonomy. This was not a great job. In fact, this was not even a decent job. It’s here that Lulu could have easily fallen into the first control trap: Finding yourself stuck in a boring job is exactly the point where breaking away to pave your own non-conformist path becomes tempting. The more I met people who successfully deployed control in their career, the more I heard similar tales of resistance from their employers, friends, and families. By this point in my quest, I’ve encountered enough stories of control going both right and wrong to know that this conundrum is serious—perhaps one of the single most difficult obstacles facing us in our quest for work we love. The cheery slogans of the courage culture are obviously too crude to guide us through this tricky territory. We need a more nuanced heuristic, something that could make clear exactly what brand of control trap you’re facing. Avoiding the Control Traps In which I explain the law of financial viability, which says you should only pursue a bid for more control if you have evidence that it’s something that people are willing to pay you for. “Money is a neutral indicator of value. By aiming to make money, you’re aiming to be valuable.” He also emphasized that hobbies are clearly exempt from this rule. what’s important to note now is that her mission provides her a sense of purpose and energy, traits that have helped her avoid becoming a cynical academic and instead embrace her work with enthusiasm. Her mission is the foundation on which she builds love for what she does, and therefore it’s a career strategy we need to better understand. To have a mission is to have a unifying focus for your career. It’s more general than a specific job and can span multiple positions. Here’s the leap I made as I pondered Pardis Sabeti around the same time I was pondering Johnson’s theory of innovation: A good career mission is similar to a scientific breakthrough—it’s an innovation waiting to be discovered in the adjacent possible of your field. If you want to identify a mission for your working life, therefore, you must first get to the cutting edge—the only place where these missions become visible. Princeton Web Solutions, in other words, had inoculated me against the idea that occupational happiness requires a calling. Because of these early experiences, I looked on with curiosity, once I arrived at college, when my classmates began to wring their hands about the question of what they wanted to do with their lives. For them, something as basic as choosing a major became weighted with cosmic significance. The second type of structure I deployed was information structure—a way of capturing the results of my hard focus in a useful form. After these first two steps, emboldened by my initial successes in deploying hard focus, I moved on to the big guns: proof summaries. This is where I forced myself to take each lemma and walk through each step of its proofs—filling in missing steps. I would conclude by writing a detailed summary in my own words. This was staggeringly demanding, but the fact that I had already spent time on easier tasks in the paper built up enough momentum to help push me forward. I also track my hours spent on these bets in the hour tally I described back in the section of this conclusion dedicated to my application of Rule #2. I found that without these accountability tools, I tended to procrastinate on this work, turning my attention to more urgent but less important matters. A fulfilling working life is a more subtle experience than his old fantasies had allowed. As we chatted, Thomas agreed that a good way of describing his transformation is that he came to realize a simple truth: Working right trumps finding the right work. He didn’t need to have a perfect job to find occupational happiness—he needed instead a better approach to the work already available to him. One of the best I have ever read. Real advice about what works for working life. Thanks for sharing this. Such a great book! I recommend to anyone who has a carrer or wants to develop one that's really fulfiling and meaningful. 5,0 de 5 estrelasWorking right trumps finding the right work. Uma ótima leitura para cair na real e fazer na vida o que precisa ser feito. Quem vive de sonho é padeiro. Um livro que todos os que procuram um vocação profissional deveriam ler. É um livro revolucionário porque tira o foco da paixão para o esforço. Conteúdo muito bom e de grande utilidade para quem quer conhecer mais sobre negócios. Gostei muito da abordagem "não seguir a paixão". Uma visão totalmente diferente de muitos autores.Recomendo.